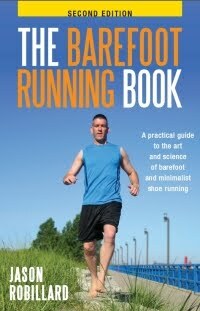 A couple of months ago Jason Robillard approached me asking if I'd be interested in reviewing his book The Barefoot Running Book: A Practical Guide to the Art and Science of Barefoot and Minimalist Shoe Running. Being one eager to see how others can learn about barefoot running, I graciously accepted Jason's offer and a couple of weeks later a copy of his booked dropped through the letterbox. Thanks Jason. The first thing that struck me was the size of the book, or more precisely the lack there of. The book is A5 in dimensions and has only 52 pages of reading material, excluding the exercises and appendix at the back, however the lack of size is easily made up by the wealth of information contained within. The book is broken up into 5 progressive sections: Why Barefoot Running, Pre-running, Starting to Run Barefoot, Intermediate Barefoot Running and finally Other Topics which covers things like hecklers, training and cross training. Each section is broken into individual points explaining a concept, activity or issue, and provides a clear description of each as it guides you from the very beginning up to the point of being a relatively seasoned barefoot runner. As the whole book is written as a series of progressive points, it does make it feel a bit "jumpy" when reading it cover-to-cover. I got the feeling that it may have come from a collection of blog posts compiled into a single book. However this structure does make it an easy reference to turn to if you need to check up on something quickly so it's perfectly suited to the beginner who would otherwise spend the time trawling the web for answers. 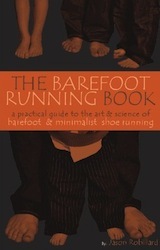 With the structure and layout of the book out of the way, I can say Jason does a good job of introducing the complete beginner to the world of barefoot running. He starts off by correctly pointing out that barefoot and minimalist running may not be for everyone, whether that be due to medical or preferential reasons, but does mention that it's definitely worth considering, even if just as a supplement to your normal shod running. He also references several studies on the effects of modern running shoes, but doesn't go to the point of bashing the manufacturers. Jason then takes the reader through a deliberately slow and relaxed approach to getting ready for barefoot running, relaxing (this is very important and Jason puts a lot of emphasis on this), strengthening the feet and skin, and then finally heading out for a run. Just before the reader actually heads out for their first run, the topics of cadence, form and posture are covered and then once out running things are progressed nicely to cover efficiency, different terrains, weather and increasing speed and distance. The book then finishes off covering developing your training further and incorporating cross training for development of the rest of your body. I do have a few criticisms with the book. First is its price: I didn't have to pay for my copy, but others may be a bit disappointed by the size of the book compared to it's price, however the book is self published so the costs will be higher. Next is Jason's suggestion that people find the form that feels right for them. My own experience is showing that this is not the best approach. Form is important and whilst the comfortable form it easy to fall into and get used to, it may not be the best and without correction injury may ensue. Lastly, and this isn't really a criticism, but a niggle: the cover it terrible. I wouldn't pick this book up when passing it on a shelf in the book shop. Thankfully for Jason, he's been told this already, or worked it out for himself as the next edition is coming with a much more attractive cover (see right). In summary, The Barefoot Running Book is a good, easily referenced, introduction to barefoot running for anybody interested in taking up barefoot running, or just incorporating a bit of barefoot running into their training schedule.